We are pleased to welcome back Mark Coull, who rejoins the band as part of the cornet section and Andy Brewer who once again takes up the bass trombone position, which had become vacant following Mark Welch's transfer to solo trombone, to fill the vacancy left by Henry Bamber, who unfortunately left the band due to increased school work and other commitments. 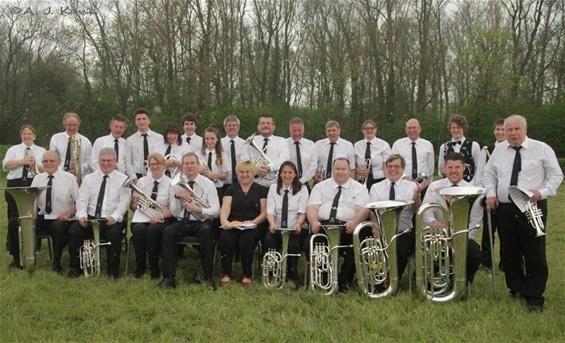 Earlier in the year Joshua Gilding, the grandson of one of our members, joined the band on the back row cornet section. Even though Joshua was a very competent cornet player he showed interest in learning both kit and tuned percussion and has now made the decision to transfer to the perussion section full time. This is great news for the band, as we have been without a permanent percussionist for a while, having to rely on the services of deps for our concerts. 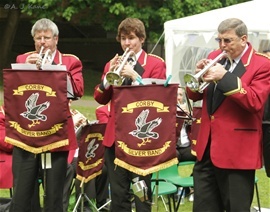 Our first concert of the summer took place on 14th May and was part of the Croyland Gardens Music Festival in Wellingborough. We played a varied reptoire of pieces during our two performances which included the cornet feature - 12th Street Rag, superbly played by three of our solo cornet players, Dave Ashby, James Wilson and Geoff Beeby. Later in the year, on Saturday 7th May, we once again took part in the annual entertainment contest held at Wood Farm Brewery. The weather report hadn't sounded too good, but luckily the rain held off until ... it was our turn to play. Unfortunately there was a downpour of rain, complete with lightning during our performance. 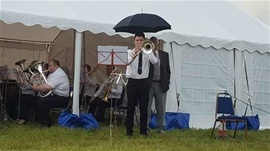 This year our solo feature was performed by our principal trombone player Henry, who continued to play stood outside the marquee even though he was getting drenched, until one very kind member of the audience held his umbrella over Henry's head trying to protect him from the worst of the rain. We received lots of positive comments from the adjudicators, but with there being more competition with an increased amount of 3rd section bands entering this year, we were just out of the prizes, being awarded a very creditable 4th place. We are pleased to have welcomed a few new members earlier in the year. Mark Welch has joined us to fill the bass trombone vacancy. Mark previously depped for the band when we played at a concert in Rothwell last year. After visiting lots of other local bands, Mark has decided that he would like to become a member of Corby Silver Band on a permanent basis. Also joinng us is James Wilson, who has become our assistant prinicpal cornet player. James is a very talented young player, who will be able to step in and cover the principal cornet position at engagements and rehearsals when our prinicpal cornet player is unavailable. We also welcomed back Mark Asbrey who has returned to the horn section following his time working in Canada. On Sunday 13th March, Corby Silver Band took to the stage with their performance of the area test piece 'The Journal of Phileas Fogg'. The band had been working hard practising this piece during rehearsals and our efforts were rewarded with a pleasing 6th place out of 18 bands. This was the bands highest placing for the last couple of years and so we were very happy with our result.